Work packages for building the ITER installation are divided into tender batches (TB), which are packages of activities awarded by the European Domestic Agency for the design, construction and equipment of buildings or the realization of infrastructure. 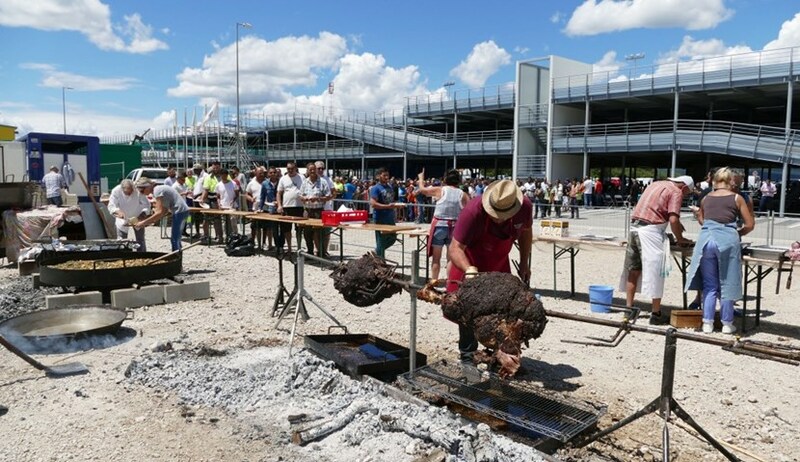 Fully three million work hours have been executed in the scope of the EUR 300 million TB03 contract, a milestone that called for a celebration in the form of a gargantuan barbecue. TB03 is the largest civil works contract of the ITER scientific installation, worth close to EUR 300 million. It was awarded in late 2012 to a consortium led by three major European companies—VINCI and Razel-Bec from France, and Ferrovial Agroman from Spain. TB03 covers the construction of 12 buildings (including the Tokamak Complex, cryoplant, Assembly Hall, and Control Building) and several strategic structures such as the plant bridges that transport electrical power and cooling fluids to the machine. 150 kilos of bull meat slowly roast over the fire, with the ITER Assembly Hall in the background. Signed in December 2012, TB03 is now about half way to completion. Fully three million work hours have been executed by the consortium and its subcontractors. This highly symbolic milestone called for a celebration. 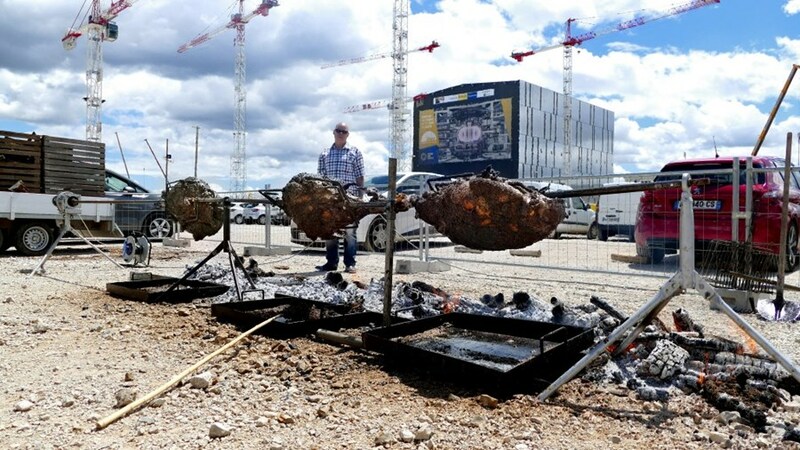 On Thursday 29 June, for the first time in four-and-a-half years, the ITER worksite came to a standstill in broad daylight, and at the invitation of the consortium 1,000 workers took off helmets, gloves and jackets to gather for a gargantuan barbecue. 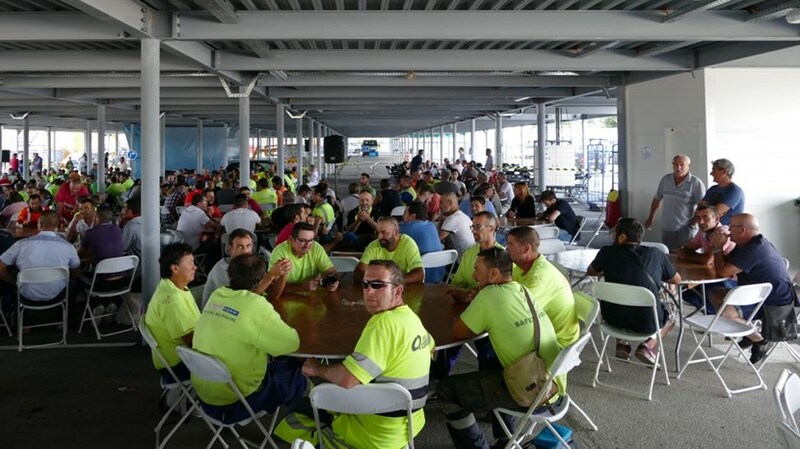 At the invitation of the European consortium 1,000 workers took off helmets, gloves and jackets to gather for the giant party. On the menu: Spanish paella (400 kilos) and roasted bull meat (150 kilos) from the French Camargue region.